Why is it always him? Tabloid speculation suggested that Mario Balotelli's troubled relationship with Manchester City might be nearing an end after a training-ground brawl with manager Roberto Mancini. The player and manager had to be separated after Mancini took exception to a Balotelli tackle. Balotelli's challenge on Scott Sinclair riled Mancini. Coaching staff had to intervene as the pair grappled. Balotelli headed off to the dressing-room and left training just ten minutes later. 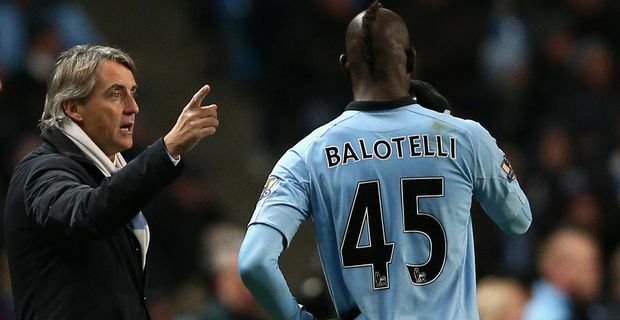 It's not the first time the volatile striker and his equally tempestuous manager have clashed, although Mancini has remained broadly supportive of Balotelli through a series of bizarre off the field incidents. A club insider quickly suggested that the fight was a "storm in a teacup" and “forgotten about instantly" but it's an embarrassment to a club that must be regretting the fact that its training sessions can be witnessed, and filmed, by members of the public. What happens in training is all over the tabloids within hours. Previously Mancini had dismissed rumours that Balotelli would be moving on in the January transfer window. "I think Mario will stay but the future depends mostly on him," Mancini told the Italian press, after reported interest from Milan in signing the player. "Sheikh Mansour likes Balotelli because he recognises the talent and he exports the name of City over the world. Mancini has known about Balotelli's reputation since his early days at Internazionale, and insists that he doesn't have a problem with him, personally at least. "The relationship between me and him is always good, even if one day he does something," he said. “I love him because for many years we live together. I've seen him grow. But the professional relationship is another thing and I've told Mario what I need from him. I ask from him seriousness and commitment in training, a more stable private life and correct behaviour on the pitch."